Geneviève Cotnam, a judge of the Court of Quebec, has been appointed a judge of the Court of Appeal of Quebec in Quebec City. She replaces Justice Jean Bouchard, who elected to become a supernumerary judge effective Sept. 1, 2017. Born in Toronto, Justice Cotnam moved to Quebec City in 1982. She obtained her LLB from Laval University in 1989 and was admitted to the Quebec bar in 1990. She then practised law with the firms of Flynn Rivard (1990-2003), Desjardins Ducharme Stein Monast (2003-2007) and Stein Monast (2007-2016). Her main areas of practice were civil and professional liability and insurance law, allowing her to develop wide-ranging experience in civil and administrative law. Justice Cotnam was appointed to the Civil Division of the Court of Quebec in 2016. Throughout her work as a judge, she strove to promote access to justice while ensuring efficient and respectful case management. Prior to her appointment, Justice Cotnam was actively involved in promoting legal education. In addition to her practice, she lectured at the École du Barreau (Quebec Bar School) and the Faculty of Law at Laval University, where she helped supervise the Pierre-Basile-Mignault Moot Court Competition. She was also frequently called on to lecture across Quebec and Canada and contributed to a number of works on civil and procedural law. Justice Cotnam also volunteered with the Quebec bar, where she sat on the Complaints Review Committee, helped prepare a guide dealing with best practices, and served on a working group on investors. 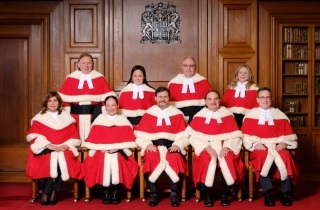 She was also a member of the Quebec bar’s Court of Appeal Committee for a number of years.